A New Map of Part of the United States of North America, exhibiting The Western Territory, Kentucky, Pennsylvania, Maryland, Virginia & C. Also, the Lakes Superior, Michigan, Huron, Ontario & Erie; with Upper and Lower Canada & C. From the Latest Authorities. 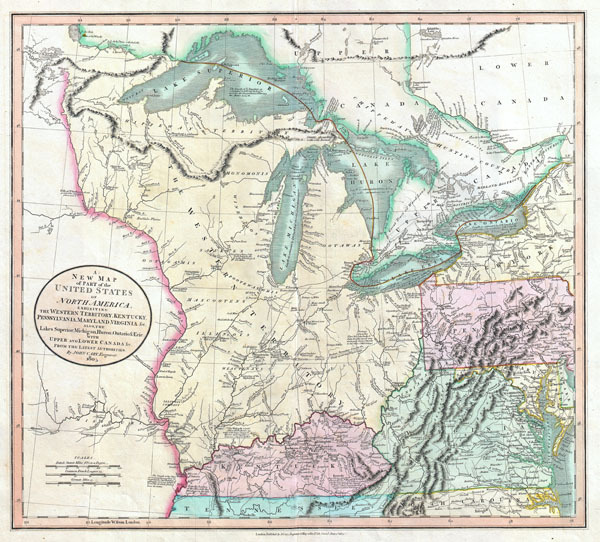 Published by John Cary in 1805, this is one of the most interesting and attractive maps of the American Frontier and the Great Lakes to emerge in the first years of the 19th century. Covers from Lakes Superior south along the Mississippi River as far as Kentucky and Tennessee. Extends eastward to include the Western Territory, Virginia, Pennsylvania, Ontario, and parts of New York, North Carolina and Maryland. This wonderful map was produced during a period of rapid westward expansion toward the Mississippi River and attempts address a general fascination with this largely unexplored territory. One of this map's most compelling features is the massive 'Western Territory' encompassing all of modern day Ohio, Indiana, Michigan, Wisconsin, Illinois and parts of Minnesota. Offers copious notations and comments throughout, most of which are extremely interesting. A note in Kentucky, for example, referencing the frontiersman Daniel Boon, reads 'Kentucky, this Colony was first discovered by J. Macbride & others in the Year 1754. Col. D. Boon explored it in 1769 & with his family & five other began the first settlement in 1773.' Also indicates the 'Indian Boundary Line' through modern day Ohio and Indiana under the 1795 treaty of General Wayne. Notes the Illinois Company's claims near St. Louis. Offers considerable commentary on various portages, rapids, waterfalls, and other obstacles to river navigation. Shows the locations of various American Indian tribes, the 'Buffalo Plains,' fishing grounds, hunting territory, and explorer's routes. This is also one of the last maps to show the mythical 'Ile Philippeaux' in Lake Superior. All-in-all a fascinating map of American at the first stages of the westward expansion and an important piece for most American post-Revolutionary period map collections. Prepared in 1805 by John Cary for issue in his magnificent 1808 New Universal Atlas. Very good condition. Original centerfold exhibits minor recto fading and verso reinforcement. Blank on verso..
Rumsey 1657.058. Checklist of printed maps of the Middle West to 1900, 1-0787. Phillips, P. L., A List of Maps of America in the American Library of Congress, p. 875. Sames, J.W. Index of Kentucky & Virginia Maps 1562 to 1900, p. 115. Phillips (Atlases) 714-56. New York Public Library, Map Division, 433914.